Printable color-in worksheets: Famous London landmarks and characters! 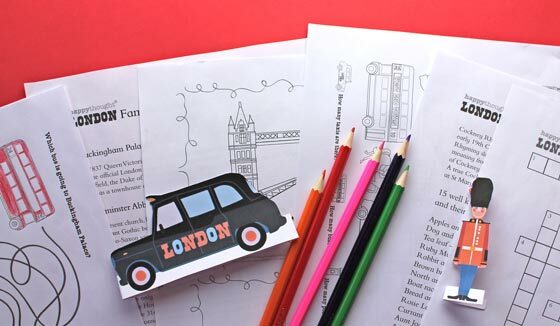 Learn about London with these London worksheets! We’re just back from a lovely trip back home to the UK and inspired by two weeks in London Town. We have put together this London printable color-in worksheets set, featuring famous London figures and landmarks. As London is also a key topic in many schools we have made the pack teacher friendly to print. 10. Wordsearch • Find 12 famous London landmarks, vehicles and characters. 11. Counting game • How many taxis, buses and post boxes? 12. Bus Route game • Which bus is going to Buckingham palace? 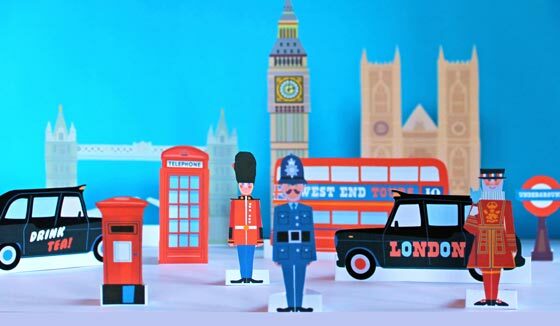 London printables: Policeman, Beefeater, black cab, Big Ben, double decker bus, Queen’s guard, Westminster Abbey, red phone box and Tower bridge. In 1837 Queen Victoria moved into Buckingham Palace. Since then it has served as the official London residence of Britain’s sovereigns. It was constructed by John Sheffield, the Duke of Buckingham and a friend of Queen Anne. It was originally built as a townhouse and was first known as Buckingham House. The present church, begun by Henry III in 1245, is one of the most important Gothic buildings in Britain, with the medieval shrine of an Anglo-Saxon saint still at its heart. The Abbey has been the coronation church since 1066 and is the final resting place of seventeen monarchs. of the Houses of Parliament. The chimes were first broadcast by the BBC on the 31st December 1923 when a microphone was installed in the turret and connected to Broadcasting House, home of the BBC. An iconic symbol of London, the bridge crosses the River Thames, close to the Tower of London. The bridge was built between 1886–1894 and is freely accessible to both vehicles and pedestrians. In 1977 Tower Bridge was painted red, white and blue for Queen Elizabeth’s Silver Jubilee. Beefeaters are official guardians of the Tower of London. They are responsible for looking after prisoners in the Tower and protecting the British crown jewels. The men you see in front of Buckingham Palace are the Queen’s Guard (Foot Guards). The men on horseback are from the household cavalry regiment. The Queen’s Guards are part of the Household Division. They have guarded the Sovereign and the Royal Palaces since 1660. The nickname for a London policeman, a Bobby, comes from the Home Secretary Sir Robert Peel. In the 1800s London had problems with rampant crime and disorder and the situation needed to be controlled. Sir Robert Peel persuaded Parliament of the importance of a new police force for London. In 1829 the Metropolitan Police Act was voted in by Parliament. Sherlock Holmes, a fictitious detective who used logic and science to solve his cases and catch dangerous criminals and villains. Sherlock was based on a real person, Dr Joseph Bell, a well known forensic scientist at Edinburgh University, who was a teacher of the author, Sir Arthur Conan-Doyle. The first Sherlock Holmes story was published in 1886 and was called A Study In Scarlet. Sir Arthur Conan-Doyle wrote 60 Sherlock Holmes detective stories and adventures in total. In 1939 the classic trademark deerstalker, pipe & spyglass first appeared in a series of films, starring Basil Rathbone. The worksheets and templates are ideal for printable kid’s crafts, teacher materials and ideas in class, home school or family activity days! 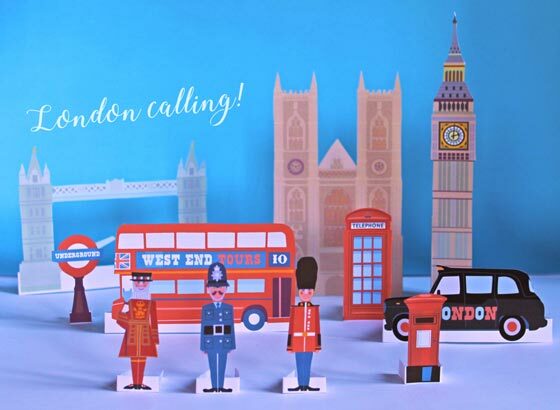 You can buy the London papercraft, coloring and worksheet pack all for just $5! We have more printable worksheets for Day of the Dead and Cinco de Mayo available in our online store. We also have printable crafts, tutorials and activities, How to make drinking straw necklaces video tutorial, how to make a paper thistle and our popular Burns Night kit to celebrate Robert Burns on the 25th January. 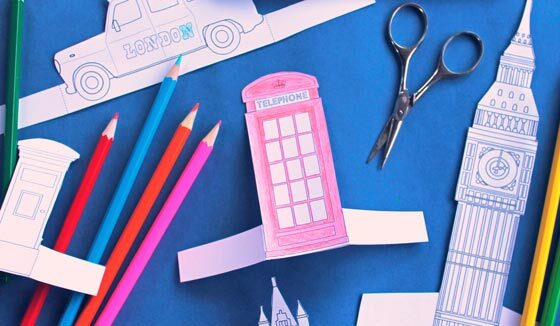 We hope you enjoyed our London color-in papercraft and worksheets! If so, please give us a little love; by liking us on facebook, pinning us on pinterest or following us on twitter. Thank you! Do you have anything that represents Spain? I love your DoD items plus the Cinco de Mayo things. Thanks for the information. j’ai une nièce en Angleterre et permettre à mes enfants de voir comment sont les bus et le reste, sous forme de jeux à imprimer, est formidable.